A rapid microtiter plate based sandwich hybridization assay was developed for detection and quantification of single RNA species using magnetic beads. Following solution hybridization target RNA molecules were collected by biotin-streptavidin affinity binding and detected by fluorescence signal generated by alkaline phosphatase. The 18S rRNA and SUC2 mRNA of Saccharomyces cerevisiae were used as model RNA target molecules. The sensitivity of the assay was approximately 1.2 × 109 (2 fmol) molecules of target RNA. The developed method was feasible with crude cell lysates of S. cerevisiae carlsbergensis and was evaluated by measuring the levels of 18S rRNA during cell growth and SUC2 mRNA under repressive and inductive conditions. The 18S rRNA expression level followed the changes in the specific growth rate. SUC2 mRNA levels were in good correlation with the measured invertase enzyme activities. The here presented sandwich hybridisation method was succefully applied for monitoring the amounts of ribosomal RNA and mRNA with high expression level in shake flask cultivation conditions. Sandwich hybridisation method offers a fast and convenient tool for following single key RNA species of interest in the production conditions. Development of novel methods for fast, sensitive and reliable RNA quantification has recently got increasing attention. Conventional methods for RNA analysis, like Northern and slot blot hybridization are in general time consuming, laborious and allow only relative quantification within a narrow concentration range. More novel methods for RNA analysis e.g. RT-PCR and real time RT-PCR are highly sensitive, but also slightly susceptible to experimental interferences, like template inhibition due to insufficient purification  and lack accuracy for quantification due to biases connected to PCR and reverse transcription reactions, which in general are accepted errors connected to these methods. The sandwich hybridization method is a suitable alternative for RNA quantification. The method is based on the detection of hybridization events between two specific oligonucleotide probes and the target nucleic acids. The capture probe is used to immobilize the target sequence on a solid support and the detection probe is labeled with a detectable marker (see Fig. 1). Sandwich hybridization is relatively sensitive and can be performed with crude biological samples . Sandwich hybridization assays from crude cell samples or in connection to PCR have been extensively used in clinical diagnostics for detection of nucleic acids from bacteria [4, 6, 7, 13, 15, 21, 23], viruses [1, 3, 9, 11, 14, 17, 25] of gene mutations  and for cell typing . The aim in our laboratory is to apply this method for monitoring of bioprocesses. The sandwich hybridization method would be ideal for measuring the levels of specific mRNAs in yeast and bacterial cells during the fermentation processes. Here we describe a sandwich hybridization method for quantification of RNA to be applied for measuring levels of specific RNAs in yeast cells as an informative tool for the control and state analysis of bioprocesses. The developed method is evaluated by measuring the levels of Saccharomyces cerevisae carlsbergensis 18S rRNA and SUC2 mRNA in shake flask experiments. The aim of the present study was the development of a fast and reliable method for quantification of single RNA species in solution using a sandwich hybridization assay applicable for analysis of bioprocesses. The influence of different parameters like probe concentrations, concentrations of the components of the hybridization solution, reaction times, amount of beads and hybridization temperatures were investigated to optimize the hybridization protocol and the sensitivity level. The 18S rRNA and SUC2 mRNA encoding invertase enzyme of S. cerevisiae were used as model RNA target molecules within this study. The sensitivity level and the linear range of the assay were determined with the solution based sandwich hybridization system using 3.1 × 106 – 7.2 × 1011 (5 amol – 1.2 pmol) in vitro transcribed 18S rRNA molecules of S. cerevisiae as target. The biotin labeled oligonucleotide probe 18S rRNA-400 was used as capture probe and the digoxigenin labeled oligonucleotide probe 18S rRNA-1302 was used for detection. The signals of the sandwich hybridization method were compared to those of the slot blot hybridization. Comparison of sandwich solution hybridization with slot blot filter hybridization assay and real-time PCR. In a) 3.1 × 107 – 7.2 × 1011 18S rRNA target molecules were added to the sandwich hybridization solution (○) or to the membrane for slot blot hybridization (●). Fluorescence (sandwich assay) and chemiluminescence (slot blot assay) signals were both generated by anti-DIG-alkaline phosphatase-FAB fragments. In b) 2 × 105 – 6 × 1010 18S rRNA target molecules were amplified by the real-time PCR reaction, using SYBR-green as detection dye (Δ). Ct is number of cycles needed to reach threshold fluorescence signal level. The error bars show the ± SD of three parallel samples. The same amounts of 18S rRNA target molecules were immobilized onto a filter membrane in slot blot hybridization assay. Digoxigenin labeled 18S rRNA-1302 probe was used for chemiluminescence detection of the target molecules. Approximately the same amount of target molecules as in sandwich hybridization assay gave a signal that was 4-fold above the noise level. With the used detection system the linear range of the slot blot method was between 1.2 × 109 and 3 × 1010 (2 – 50 fmol) target molecules. Real-time PCR experiments were performed with 18S rRNA ranging from 2 × 104 – 6 × 109 target molecules (0.04 amol – 10 fmol). Detection limit was estimated to be 4 × 105 molecules (0.6 amol) and the linear range was greater than 4 orders of magnitude, making this method most sensitive with widest linear range. To create a fast analytical system it was investigated, whether a separate total RNA extraction step is necessary or whether crude cell lysates could be used as sample material. 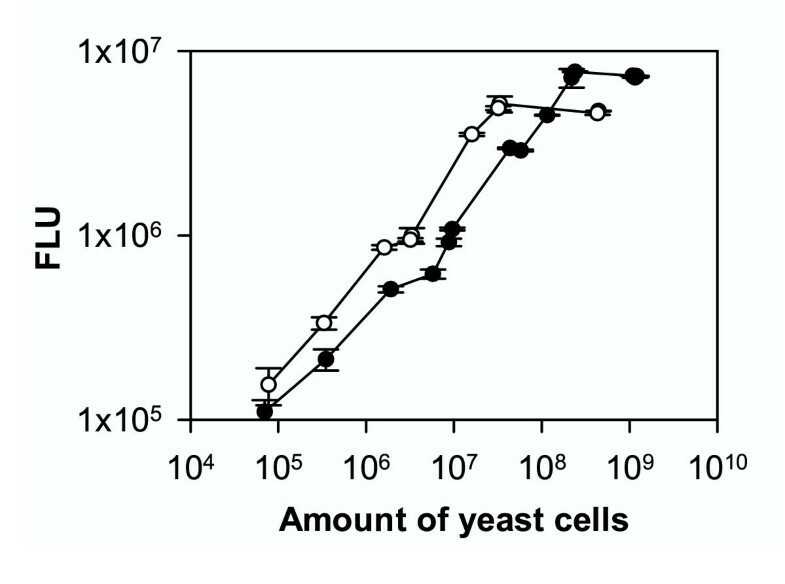 The assay was performed using either crude lysates of 7 × 104 – 1.2 × 109 exponentially grown S. cerevisiae carlsbergenesis cells or total RNA extracted from the same amount of cells. 18S rRNA was used as target for method comparison since it is abundant in the cell. Fig. 3 shows that when less than 3 × 107 cells as crude lysate were added to the hybridization solution the signal of the respective target molecules was up to 60% higher when compared to signal measured from total RNA extracted from the same amount of cells. When the amount of crude cell lysate was further increased the signal started to decrease probably due to unspecific reactions of the crude cell material. With total RNA the same inhibition effect was observed when more than 2.5 × 108 yeast cells were used for extraction. Comparison of extracted total RNA and crude cell lysate as sample material in the sandwich hybridization assay. 18S rRNA was used as target molecule for method evaluation. 5 ml of OD600 = 2 yeast culture was lysed (○) or used for extraction of total RNA (●). Different dilutions of lysed yeast cells or total RNA extracted from the same number of cells were added to the sandwich hybridization solution. Fluorescence (FLU) measured with 18S rRNA probes is presented in relation to the amount yeast cells used for lysis or extraction of RNA. The error bars show the ± SD of three parallel experiments. The effect of biological material on the signal of the solution hybridization was studied by incubating various amounts (2 × 105 – 1 × 109) of lysed S. cerevisiae BY4737 cells or total RNA extract of the cells together with 1 × 1011 in vitro transcribed SUC2 mRNA target molecules. BY4743 yeast cells contained undetectable levels of SUC2 mRNA when grown on glucose (data not shown). 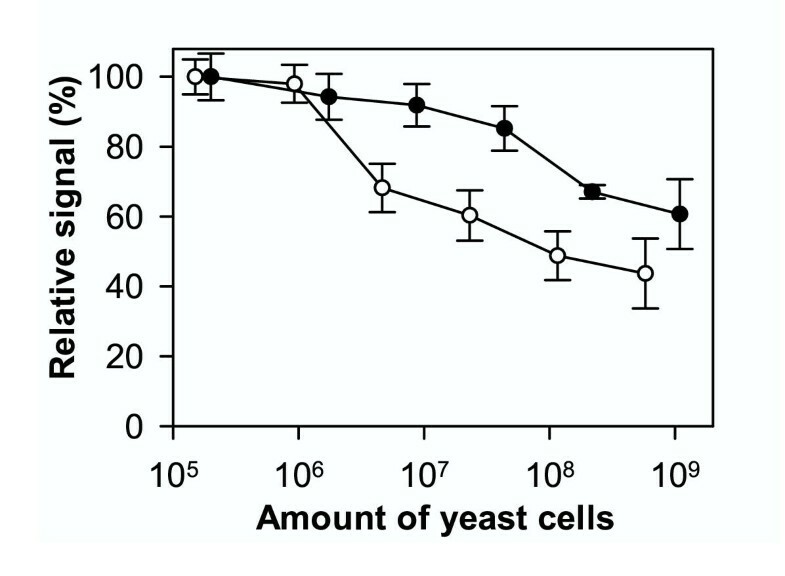 No inhibition was observed when 106 or less lysed yeast cells or their RNA content were added to the hybridization (Fig. 4). 40 – 55% decrease in the signal of SUC2 mRNA was observed when 107 to 109 lysed cells were added to the hybridization solution. With extracted RNA the decrease was respectively 15 – 40%. Effect of cell lysate and total RNA on the signal of the solution hybridization. 1.5 × 1011 SUC2 in vitro transcribed RNA molecules were added to the hybridization solution containing crude cell lysate (○) or RNA extract (●) from 1 × 106 – 1 × 109 S. cerevisiae cells grown on glucose. The results are expressed as a percentage value of the signal compared to that obtained with the same amount of pure in vitro transcribed target SUC2 mRNA. Approximately 1.4 μg total RNA was extracted from 1 × 108 cells. The error bars show the ± SD of three parallel samples. The inhibition effect of cell lysate on the hybridization was taken in to consideration, when the signal of target RNA in sandwich hybridization was quantified in growth experiments (see Fig. 5 and 6). Level of 18S rRNA of S. cerevisiae carlsbergensis determined by sandwich hybridization as molecules per cell (●) in different growth states. The growth was followed by measuring the optical density at 600 nm (○) and the specific growth rate μ (□) was determined. The yeast was cultured in medium containing 1% yeast extract, 2% Bacto peptone solution and 2% glucose as carbon source. 1 × 106 – 3 × 106 yeast cells as crude lysate was added to sandwich hybridization for 18S rRNA analysis. OD600 = 1 corresponds to 5.5 × 108yeast cells ml-1. The error bars of show the ± SD of three parallel samples. Level of SUC2 mRNA of S. cerevisiae carlsbergensis given as molecular amount per cell determined by sandwich hybridization (●) and the activity of invertase (▲) during exponential growth in medium containing 1% yeast extract, 2% Bacto peptone solution and either a) 2% sucrose or b) 2% glucose as carbon source. Growth was followed by optical density at 600 nm (□). 7 × 107 – 1.2 × 108 yeast cells as crude lysate were added to the sandwich hybridization for 18S rRNA analysis. The error bars show the ± SD of three parallel samples. To evaluate the developed sandwich hybridization assay with respect to its application in monitoring of different RNA species in bioprocesses, 18S rRNA and SUC2 mRNA were analyzed at different growth phases during shake flask cultivations of S. cerevisiae carlsbergensis. 18S rRNA was used as target for method evaluation due to its high cellular amount and stability. mRNA molecules represent only approximately 5% of total RNA in yeast  and thus are suitable targets for sensitivity evaluation. Expression of SUC2 mRNA expression can additionally be easily controlled by glucose repression . Fig. 5 shows the level of 18S rRNA detected by the solution based sandwich hybridization assay in relation to the optical density and the specific growth rate of the yeast. The amount of 18S rRNA molecules per cell was calculated on the basis of a standard curve created with in vitro transcribed 18S rRNA. The hybridisation efficiencies of probes to native 18S rRNA and in vitro transcribed 18S rRNA were assumed to be the same. The assay was performed with a low number of 1 × 106 – 3 × 106 lysed yeast cells. Therefore the inhibitory effect of the cell extract on the assay was negligible (see Fig. 4). During the first 5 hours the 18S rRNA level was slightly increasing and after that a nearly constant decrease was observed until 60 hours of growth. These results are in good correlation with the determined growth rate μ at the examined sampling points. Due to the fact that the preculture used for inoculation was in exponential growth phase, the increase of the 18S rRNA during the initial lag phase is relatively low. Invertase activity is known to be under glucose repression and the corresponding SUC2 gene expression is induced by sucrose . In Fig. 6 the level of SUC2 mRNA and the invertase enzyme activity were detected in cultures of S. cerevisiae carlsbergensis grown in shake flask cultures. In the two experiments the cultivation medium contained either sucrose or glucose as carbon source. For the calculation of the level of SUC2 mRNA the hybridization assay was performed with a cell extract containing 7 × 107 – 1.2 × 108 lysed cells. In this case the inhibition effect of the biological material on the assay had to be considered according to Fig. 4 and the signals were accordingly corrected by 50 – 55% in dependence on the specific amounts of extract used. During the initial growth phase the invertase activity was about 200 to 300 U μg-1 fresh cells in sucrose grown culture but slightly lower (100 – 200 U μg-1) in glucose grown culture. 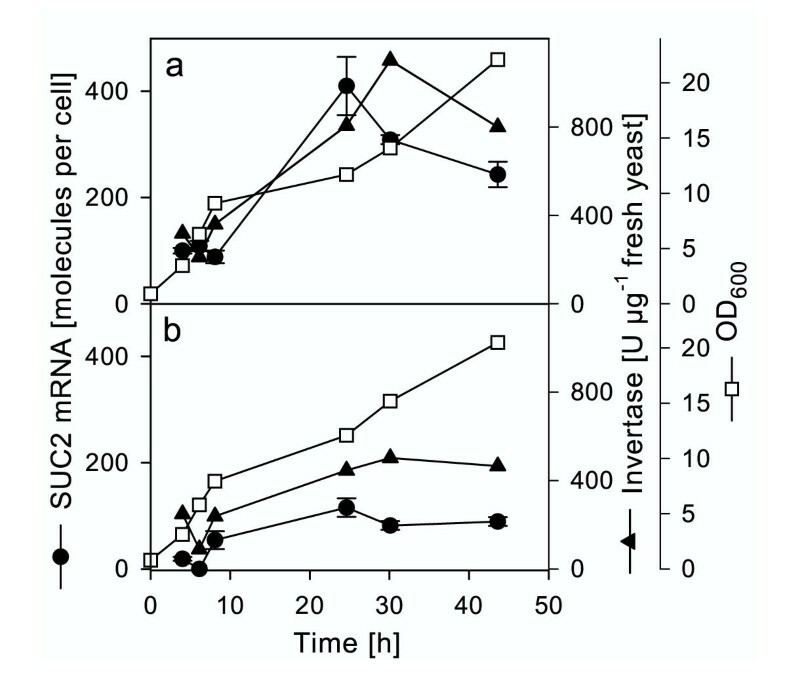 In contrast the level of SUC2 mRNA was 5 – 10 times higher in the sucrose culture than in the glucose containing culture. 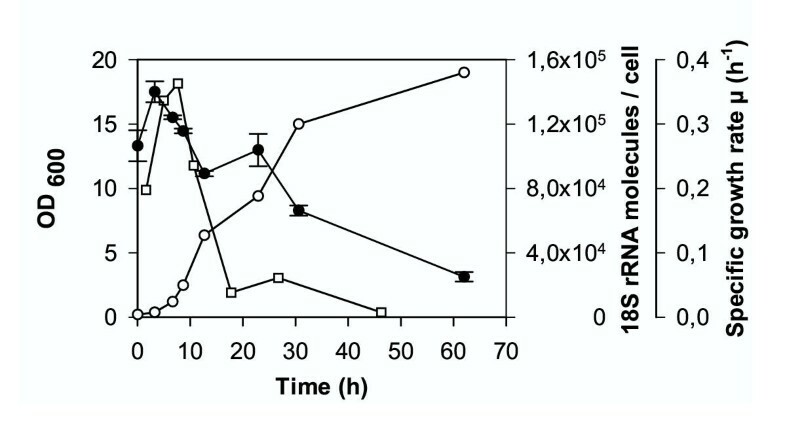 After 24 h of cultivation the total activity of invertase was significantly higher in the sucrose grown culture than in the glucose grown culture (800 to 1100 U μg-1 versus 450 U μg-1). Correspondingly there was an approximately four times higher amount of SUC2 mRNA detected in the sucrose grown culture than in the glucose containing culture (Fig. 6). The developed assay is based on hybridization of RNA target molecules with a biotin labeled capture probe and a digoxigenin labeled detection probe. Alkaline phosphatase enzyme is attached to the detection probe after hybridization, which amplifies a fluorescence signal used for quantification. The indirect enzyme labeling system was able to detect 109 RNA target molecules. This is comparable to the sensitivities reached by others with similar detection systems used for PCR product quantification [16, 23]. With direct probe labeling by thermostable alkaline phosphatase 100-fold higher sensitivities have been reached in other studies [12, 26]. Although the direct labeling is more sensitive, the indirect labeling method of the probes is beneficial if the aim is to measure a large number of different RNA targets in one microwell plate. Each detection probe does not have to be labeled separately with an amplifying enzyme, which decreases the storage time of the probes. The aim here was to apply the developed method for RNA expression monitoring of fermentation processes. Recently, this was performed by Jürgen et al. and Schweder et al. by slot blot analysis, which is in general time consuming and laborious. Here we present a simpler and faster method, with the possibility to use crude cell lysates instead of extracted RNA as a major improvement. We found up to 60% higher signal intensities with crude lysates when less than 3 × 107 lysed yeast cells were used per hybridization, possibly because a loss of target RNA during extraction procedure can be avoided. Carlson et al. have reported approximately 30% loss of RNA with affinity resin based extractions. Avoiding this by use of lysates provides a great benefit compared to RT-PCR and array based methods, which always require a separate RNA purification step. Use of high concentrations of either cell lysate or total RNA caused a decrease of the fluorescence signal possibly due to unspecific binding. With low cellular levels of target RNA more cell material is required in the assay, and correspondingly, then inhibition has to be considered in signal quantification . Thus the amount of cell lysate used in hybridization assay should be optimized for routine analysis. The sensitivity of the used sandwich hybridization assay was determined to be approximately 2 fmol, which was similar to the membrane based slot blot hybridization assay. Nevertheless, the linear range of the solution hybridization was approximately 20-fold higher compared to membrane hybridization. The time required for the sandwich assay from sampling to detection was about three hours, which could be further shortened. In contrast, the membrane based hybridization and detection could not be completed within less than 12 hours. The main difference of the two methods is the time it takes for the hybridization to reach equilibrium. Real-time PCR takes about 5 hours to complete and was in our investigation the most sensitive method (0.6 amol), but this method suffers from the demand of a very pure RNA preparation in order to avoid inhibition of the reverse transcriptase and DNA polymerase. The described method was evaluated in shake flask experiments, where 18S rRNA and SUC2 mRNA levels were measured during different growth phases. rRNA can be used as an indicator of cellular activity or growth state . Results showed that the changes in 18S rRNA expression level were simultaneous with the changes in the specific growth rate μ during different growth phases of the yeast S. cerevisiae carlsbergensis. SUC2 mRNA levels were in good correlation with the measured invertase enzyme activities. Cultivation of S. cerevisiae carlsbergensis in either glucose or sucrose containing medium resulted in different levels of SUC mRNA and invertase activity. Our experiments confirm the knowledge that brewery strains are less sensitive to glucose repression than laboratory strains and are thus often more adapted to disaccharide utilization . Whereas we found expression of SUC2 mRNA in S. cerevisiae carlsbergensis glucose-grown cultures, no expression of SUC2 mRNA was found in corresponding cultures of the laboratory strain S. cerevisiae BY4737 (data not shown). The molecular amount of RNA per cell was calculated using in vitro transcribed 18S rRNA or SUC2 mRNA as standards. We determined 25 000 – 140 000 18S rRNA molecules per cell in dependence on the different growth phases. These values are in good agreement with results presented by Warner, who calculated about 200 000 ribosomes in exponentially growing yeast cells . For highly expressed genes 200 – 400 mRNA copies per cell have been determined with SAGE analysis . In our current study the SUC2 mRNA level has been calculated in the same range. The number of mRNA molecules varied between 100 – 400 molecules per cell when invertase formation was induced. Quantification of the in vitro standard RNA, sample mRNA stability, and the effect of the biological material on the hybridization efficiency can cause inaccuracies to the quantification of the target mRNA species, but our method seems to provide a fair estimation of the molecular levels of RNA. The sensitivity of the developed method was found to be sufficient for detection of intracellular rRNA molecules and highly expressed mRNA species. For RNA molecules with a low expression level a higher sensitivity would be desirable if crude cell lysates are used as sample material for the analysis, to avoid the use of cell concentrations which inhibit the analysis. Although for physiological studies the number of target RNA molecules of low expressed genes can be increased by increasing the amount of cell extract, signal inhibition has then to be included into the calculations. Automation of the sandwich hybridization and technical improvements e.g. detection of targets with electric biochips  are making the sandwich hybridization method interesting for many application areas especially for clinical diagnostics, food industry use and even for the detection of bioweapons . One of the challenging applications is the state analysis of bioprocesses based on transcriptional profiling of key genes that reflect the physiological state of the producing organism. The here presented method in view of its automation capabilities offers a valuable tool in this direction. Alternative and novel methods for RNA analysis are being developed for clinical and industial diagnostics as well as for studing the physiology of living cells. The aim of the present study was the development of a fast and reliable method for quantification of single RNA species in solution using a sandwich hybridization based assay applicable for physiology analysis of organisms used in bioprocesses. The presented method allows the use of crude cell lysates as sample material and offers a sensitivity level suffiecient for measurement of ribosomal RNAs and messenger RNAs with relatively high expression levels. The developed method was evaluated by measuring the levels of Saccharomyces cerevisae carlsbergensis 18S rRNA and SUC2 mRNA in shake flask experiments. The measured 18S rRNA level was consistent with the specific growth rate and thus could be used as an indicator of growth state of a cell. SUC2 mRNA was in accordance with measured invertase activities under glucose repression and sucrose induction. S. cerevisiae strain BY4743 and the industrial S. cerevisiae carlsbergensis strain LK01 were used for cultivation. Cells were grown in medium containing 1% yeast extract (Difco), 2% Bacto Peptone (Difco) with 2% glucose or sucrose as carbon source at 30°C and 200 rpm in baffled shake flasks. For the culture used in analysis 20 ml of a 24 h grown preculture was inoculated in a 1 l flask containing 200 ml fresh medium. Growth was followed spectrophotometrically by measuring the optical density at 600 nm. The culture was grown for 60 h, during which yeast samples were taken for analysis. For RNA analysis 5–10 ml samples were taken depending on the growth state. The cell number in relation to OD was deterimed by Thoma cell counting. Cells were centrifuged at 20800 × g for 10 min at 4°C, washed with cold DEPC water and frozen at -70°C before analysis. Frozen yeast cells were suspended to 250 – 500 mg fresh yeast ml-1 with lysis buffer containing 550 U ml-1 Lyticase (Sigma), 1 × SSC (0.15 M sodium chloride, 0.015 M sodium citrate, pH 7.0) and 0.2% RNA guard RNase inhibitor (Amersham Pharmacia). After addition of 100 μl of acid-washed beads (diameter 425–600 μm, Sigma) cells were disrupted with a FastPrep cell homogenizer (ThermoSavant) using 6 m sec-1 for 45 sec. Lysed cells and beads were rinsed with 100 μl DEPC-treated water. The cell lysate was directly used for RNA analysis. Total RNA from freshly grown yeast cells was extracted using the TOTAL RNA kit (A&A Biotechnology, Poland) following the protocol provided with the kit. A maximum of 50 mg of cells was used per extraction to not exceed the binding capacity of the silica columns. Extracted RNA was quantified by absorbance measurement at A260 (DNA Quant, Pharmacia). Synthesized RNA was quantified by RiboGreen RNA Quantification Kit (Molecular Probes) as recommended by the manufacturer. 3' end biotin labeled capture probes, were custom-synthesized by Sigma Genosys. Detection probes were labeled with digoxigenin with oligonucleotide 3' end labeling Kit (Roche Diagnostics) (Table 1) as recommended by the manufacturer. Sequences of the oligonucleotide probes used in sandwich and slot blot hybridizations. All probes are designed for S. cerevisiae. The total RNA extract, crude cell lysates or in vitro synthesized control RNA were diluted in buffer containing H2O, 20 × SSC and deionized formamide in a ratio of 5:3:2 and denaturated at 65°C for 3–5 min before addition to hybridization reaction with 3 × 1012 molecules of biotin labeled capture probe and 2.4 × 1012 molecules of DIG-labeled detection probe. The hybridization reactions were carried out in 96-well plates (Greiner) at 50°C for 30 min at 600 rpm shaking (Thermomixer Comfort, Eppendorf) in a total volume of 100 μl containing 5 × SSC, 0.5% SDS, 0.02% Ficoll, 0.02% polyvinyl pyrrolidone, 0.02% BSA, 20% deionized formamide, 4% dextran sulfate. The hybrid collection was performed by addition of 20 μg of streptavidin coated magnetic beads (Promega) to the hybridization reaction followed by incubation at 37°C for 30 min at 600 rpm. The beads were washed three times with 1 × SSC buffer and afterwards 50 μl of conjugation buffer (50 mM Tris pH 7.5, 150 mM NaCl, 0.3% Tween 20, 1% BSA) containing 35 mU anti-DIG-alkaline phosphatase FAB fragments (Roche Diagnostics) were added to the beads and incubated for 30 min at room temperature. After six washing steps with washing buffer (50 mM Tris pH 7.5, 150 mM NaCl, 0.3% Tween 20), 150 μl of AttoPhos substrate (Promega) were added to the beads and incubated for 20 min at 37°C. The magnetic beads were separated between the washing steps with a MagnaBot 96 Magnetic Separation Device (Promega). The clear supernatants were transferred to a black 96-well plate (Greiner) for fluorescence measurement performed with Victor 2 fluorescence reader (Wallac) at exitation wavelength 430 nm and emission wavelegth 560 nm. For detection of yeast 18S rRNA by slot blot hybridization the 3' end DIG-labeled probe 18SrRNA-1302 (table 1) was used. After denaturation in buffer containing H2O, 20 × SSC and formaldehyde in the ratio of 5:3:2 at 65°C for 10 min dilution series of in vitro transcribed 18S rRNA were blotted onto positively charged nylon membranes (Amersham Pharmacia) using Bio Dot vacuum (BioRad). 1 h prehybridization and over night hybridization were carried out at 50°C using High SDS hybridization buffer (7% SDS, 50% formamide, 5 × SSC, 2% Blocking Reagent (Roche Diagnostics), 50 mM sodium phosphate, 0.1% N-lauroylsarcosine, pH 7.0). Signal detection was performed by chemiluminescence using CDP Star (Roche Diagnostics) as a substrate as recommended by the manufacturer and exposure to chemiluminescence films (Hyperfilm ECL, Pharmacia) for 60 min at room temperature. The film sheets were scanned by use of a flatbed scanner (Epson) and relative amounts of detected 18S rRNA were calculated by volume densitometric analysis using the Quantity One® Quantitation Software from BioRad. Real-time PCR was carried out on an ABI Prism 7700 (Perkin-Elmer-Applied Biosystems, Foster City, CA, USA), using SYBR-green as detection dye. cDNA synthesis of in vitro transcribed 18S rRNA was performed with Enhanced Avian RT first Strand Synthesis kit (Sigma), using the antisense specific primer: 18S-741R; 5'CTTGGCAAATGCTTTCGCAG. The PCR reaction was done with SYBR Green JumpStart Taq ReadyMix (Sigma), using the primers: 18S-523F; 5'CCTTGTGGCTCTTGGCGAAC and 18S-741R. Invertase activity was measured in cell lysates in a two-phase reaction. In the first phase invertase hydrolyses sucrose to glucose and fructose. In the second phase glucose and ATP form glucose-6-phosphate and ADP in a reaction catalyzed by hexokinase. Glucose-6-phosphate and NADP form 6-phosphogluconate and NADPH in a glucose-6-phosphate dehydrogenase catalyzed reaction. NADPH is measured at 340 nm. Reaction was started by adding lysed cells to a concentration of 0.6 mg ml-1 in 50 mM sodium acetate (pH 4.5) and 20 mM sucrose at 30°C with a final volume of 1 ml. Reaction was stopped after 10 min by boiling. 50 μl of the reaction solution were added to 950 μl of 50 mM Hepes (pH 8.0), 5 mM MgCl2, 3 mM ATP and 1 mM NADP. A340 was measured spectrophotometrically (Ultrospec 2100 pro, Amersham Pharmacia) before addition of 4.5 U hexokinase (Sigma) and 1.2 U glucose-6-phosphate dehydrogenase (Sigma) and again after 30 min reaction at room temperature. These studies were supported by the European RTD project QLRT-1999-00533, the SUNARE program of the Academy of Finland (project no. 52796) and personal grants to Jari Rautio by the Graduate School in Chemical Engineering (Finland) and Biocenter Oulu (Finland). JR designed the experiments and carried them out for the method development and growth experiments. KBB performed the experiments with real-time PCR. KBB and JL participated in the method development and optimisation work. SM contributed with ideas and discussions in the writing of the manuscript. AB and PN participated in the design and supervision of the work. All authors read and approved the final manuscript.